Reports from Chile and Brazil presented to the 2004 meeting of the International Executive Committee (IEC) of the cwi, held in Belgium, 14-20 November. 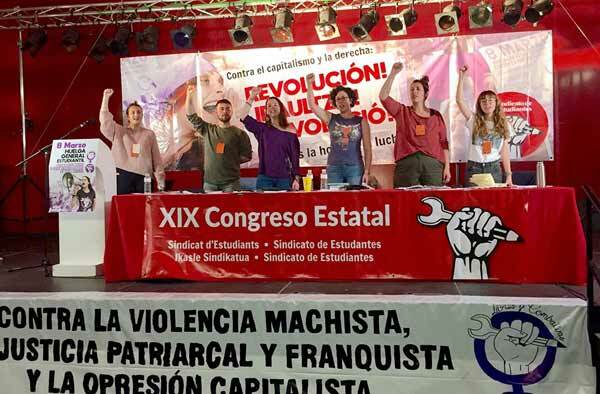 In the context of widespread turmoil in the rest of Latin America this year, Chile must be the only country where there are currently no significant social struggles. In this sense, it lags behind the rest of the continent and produces difficulties for the Chilean section of the International. But this does not mean that we have not done anything! We have produced some issues of our paper but have carried out our political work mainly through explanatory leaflets on different issues, as and when opportunities have presented themselves. This year we organised a campaign to promote and prepare for what we thought would be the second national general strike. We produced explanatory leaflets about how to organise the strike and how to extend it, distributing this material amongst different trade unions and workers in general. Later when the strike did not happen, we were the only group that provided an in-depth analysis as to why the leaders of the CUT (Trade Union Confederation), and in particular the trade union leaders in the CP, had distanced themselves from the call for strike action made at the May Day demonstrations. We are also participating in a left wing alliance called the Socialist Block, whose main aim is to defend the ideas of socialism. Within this alliance we are producing various leaflets and pamphlets and organising public meetings, etc. At the same time we have tried to run a campaign which brings together three slogans: for a minimum wage of 200,000 pesos per month, for the right to work and for a 36 hour working week. We have produced two different leaflets for this campaign, both about the same issues. Currently through one comrade we are intervening in a community organisation called the Ecological Council of La Granja. Vilma is the president of this organisation. In her role as president and also as a member of the CWI , she has produced some leaflets to spread our political ideas and find contacts for our organisation. We are also intervening in the Mapuche movement; our comrade Celso is the coordinator of the Left Mapucean Assembly in Santiago. This work could be key, given the way the indigenous struggle is developing not only in Chile, but in the whole of Latin America. At present we are preparing a leaflet for the demonstrations which are planned for November against the APEC summit, due to take place in Chile from 19 - 21 November (See report on worldsocialist.net 11 December). We are involved in the body which is coordinating action against the APEC summit. The same body is also organising demonstrations against Bush’s probable visit to Chile. At this stage, we have comrades in Santiago and Talca. New comrades are playing an important role helping with translation of material from English into Spanish. 2004 has been a special year for the Brazilian section of the cwi. The rightward shift of the Lula government triggered a far-reaching process of reorganization and realignment on the left that affected all currents, parties and organizations. The process which is still underway opens up great opportunities for Marxists, although the risks and dangers cannot be underestimated. The Brazilian section of the CWI - Socialismo Revolucionario (SR) - has been through a continuing restructuring process to face the new situation. We opened up a process of political debate on tactics, strategy, program and organization. We correctly positioned ourselves right from the beginning as an important part of the struggle to keep alive a left alternative in the face of the adaptation of PT and the Lula government to the neo-liberal capitalist order. We have worked to found the new party (P-SOL) from the beginning of the discussions and constantly sought to avoid a sectarian policy while also combating the opportunism that took over most of the left inside and outside the PT. During this process we were able to build a solid profile of SR as a relevant organization in the struggle for a new party, mainly in the state of São Paulo, which is decisive for the Brazilian left and for the P-SOL in particular. The P-SOL is still in its beginnings, and now struggling for its legalization which requires it to collect 438,000 signatures all around Brazil. By the beginning of November the total number of signatures had reached around 370,000. The aim is to reach the target by the first anniversary of the expulsion of the so-called radical parliamentarians from the PT on December 14, 2003. The P-SOL still does not have solid structures nor a consolidated and formal membership. But already there are state-wide coordinating committees functioning in most states in Brazil. There are organized branches in the main cities and states. A national commission consists of 101 members and has met only once. A temporary national executive commission with 16 members meets fortnightly on average. SR has one member on this national executive. Through our intervention in the process of founding the P-SOL, SR and the CWI have become more widely known by a wide layer of left activists throughout the country. Our web-site has now been accessed by many Brazilians and many have contacted us to know more about the organization and to consider joining. Through the P-SOL we revitalized contacts from places outside São Paulo, such as Recife, in the state of Pernambuco, and made new contacts in a number of cities in the state of São Paulo. Our main orientation is to make contact among the youth and workers on the fronts where we are active. We discuss with people who feel attracted to the P-SOL and join the party through us. There are also people who are already P-SOL members who are coming closer to our positions. But at this point there is a general feeling in favour of building the P-SOL and not necessarily one of its internal tendencies. As political debate in the party as a whole becomes more intense, this situation is likely to change. Some of our previous members have not adjusted to the development of P-SOL and stayed in the PT in order support left candidates for the council. The fiasco of the PT left in general in the municipal elections showed how this policy was mistaken. Some of these former-comrades are beginning to draw conclusions and may return to the organization. Our work among school students has also been changed as a large part of the comrades have gone on to university. This has affected the day-to-day work of the MSE (Movement for those without Education). Nevertheless representatives of the MSE are still invited to debates and talks, to give interviews to the press, etc. The issue of university access has undergone major changes under the Lula government. Illusions in Lula and the PT and the government’s promises and demagogy have placed the debate on a different level. The government is attempting to co-opt youth previously excluded from university with the promises of quotas. At the same time, they are promoting privatization-tending policies. In this context, a movement such as MSE could play a decisive role by organizing the struggle of the excluded youth and patiently explaining the role of this government in debate and in practice. Most of the other movements in this sector have already been co-opted by the government and play the role of holding back the struggles. MSE continues as a campaign that can be taken up again forcefully on the basis of some well-planned initiatives and this is what we are doing. We are taking on a full-timer on the basis of assistance from the German comrades and are taking initiatives to associate MSE with the struggle against the university reform the Lula government is introducing, including privatization. Struggles such as free transport for students are also part of our plans for MSE. The MSE will also play an important role in the intervention we are planning for ISR and the CWI at the World Social Forum in Porto Alegre. University student work has taken on central importance in the last period. We are now doing consistent work in some of the main universities in the country - the three state universities in São Paulo (USP, UNICAMP and UNESP), which are spread around several cities, and the main private university in the state (PUC-SP). We played an important role in the São Paulo state universities strike in the middle of the year. This strike saw episodes of intensive radicalization with the occupation of chancellors’ offices and pickets confronting the police, etc. The work in the P-SOL and the universities consolidated the organization in Campinas, the main city in the interior of the state. We have a functioning branch in the city, we lead the P-SOL in the region and the party is growing among secondary school students and at other universities. Our teachers’ work still reflects a certain drop in the mood in this sector. Nevertheless, we have taken a central leadership role in the construction of the P-SOL in this, the biggest union in the CUT confederation. P-SOL teachers have organized and taken initiatives to challenge the hegemony of the PSTU (IWL) in the left block inside the union (known as Alternative Opposition). We have consolidated the leadership of the Taboão/Embu teachers’ union and played an important role. We have contacts in other teachers’ branches and have a high profile in the union’s Gender and Anti-racism work. One of the central tasks of the organization in Brazil today is to consolidate a team of cadres capable of leading the work collectively and in a professional manner. In this respect we have discussed the division of the work in the leadership and ways of involving new members in more clearly defined tasks. One of the challenges is avoiding being dissolved into the P-SOL and committing the same mistakes or succumbing to the same pressures as former CWI members in Scotland or France. Having a member on the national executive of the P-SOL is very important politically, particularly with the key strategic debates now beginning on the executive and differences becoming clearer. At the same time, this has meant less time for specific SR issues. A meeting of the P-SOL executive in Brasília every fortnight means a 14-hour bus journey there, about 10 hours of meetings, and another 14 hours on the bus back! That is if we go by bus (for $75). If we went by plane, to save time and to be less physically tiring but we would have to spend $270, which is the equivalent of a full-timer’s monthly wage. We have tended to be more involved in the meetings in São Paulo or Rio de Janeiro. We have published a special photocopied magazine with more in-depth articles to use among P-SOL activists and we plan to repeat this periodically with materials from the International. We also decided to continue to publish a paper of an agitational and propaganda character. We have used our funds to ensure our paper came out. Our best growth in the near future is likely to be among university and school students. Also some among teachers. The events we are involved in include the march in Brasília on November 25 with a good contingent of members, sympathizers and contacts; the São Paulo teachers’ union conference; university student committee elections; collecting signatures in the campaign for legalization of the P-SOL and preparing for the World Social Forum in January 2005. In December the organization is due to hold a conference and vote on a political document and one on organization and construction.